Barnes & Noble Nook Also Coming to Argos, Blackwell's & Foyles in U.K.
On Tuesday, John Lewis announced it will soon become the first retailer in the United Kingdom to sell the Barnes & Noble Nook. But it's going to have some competition. The e-readers will also be coming to Argos, Blackwell's, and Foyles this fall, Barnes & Noble has revealed today. 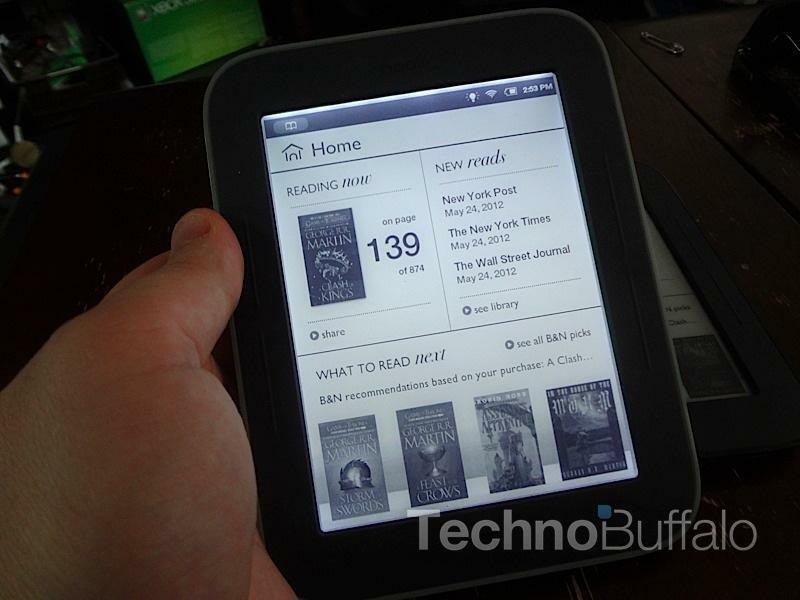 This is a big move for the Nook, and it means the device will be easily available to almost anyone who wants one. As noted by Barnes & Noble, Blackwell's is the leading academic bookstore, while Argos is one of the U.K.'s biggest retailers — with 90% of the population living within 10 miles of an Argos store. "We're excited to work with Argos, Blackwell's and Foyles to introduce our popular NOOK reading experience to an even broader audience in the United Kingdom," said Jamie Iannone, President of Digital Products at Barnes & Noble. "Argos built its brand on choice and convenience, and with 90 percent of the population living within 10 miles of an Argos store, this literally brings the NOOK experience close to home for millions of UK consumers." Like John Lewis, the trio will offer the Nook Simple Touch, and the Simple Touch with GlowLight. Details on pricing and a more specific release date won't be available until closer to launch. You can check out the full press release below. NEW YORK–(BUSINESS WIRE)–Barnes & Noble, Inc. (NYSE: BKS), the world's largest bookseller and leading retailer of content, digital media and educational products, today announced partnerships with major retailers in the UK including multi-channel retailer Argos, the leading academic bookseller Blackwell's and award-winning independent bookstore Foyles. These leading retailers will offer the highly sought-after NOOK digital products to reading and entertainment lovers in the UK this autumn. These retail partnerships are an important component of Barnes & Noble's recently announced plans to expand its award-winning, beautifully designed NOOK products to millions of customers in the UK. "From October, our customers will be able to buy NOOK online and in-store and we are sure it will be one of the must-have gadgets this Christmas." "We're excited to work with Argos, Blackwell's and Foyles to introduce our popular NOOK reading experience to an even broader audience in the United Kingdom," said Jamie Iannone, President of Digital Products at Barnes & Noble. "Argos built its brand on choice and convenience, and with 90 percent of the population living within 10 miles of an Argos store, this literally brings the NOOK experience close to home for millions of UK consumers. Blackwell's has built a reputation on its wide selection of titles and extremely knowledgeable staff, much like Barnes & Noble, and we're delighted to continue in our dedication to the education space. As London's largest independent bookshop chain, Foyles is a trusted name in books and literature in the UK, so we're pleased to work together to bring NOOK and our expansive digital catalog to people passionate about books and reading." The retail partners will first offer Barnes & Noble's top-ranked line of E Ink® Readers – NOOK Simple Touch™ and NOOK Simple Touch with GlowLight™ – in time for the holiday shopping season. NOOK will be stocked in more than 700 Argos stores, and prominently promoted through Argos' robust online and telephone catalogue starting in October, providing shoppers easy and convenient ways to learn about, try and purchase NOOK products. "As a leading retailer of technology products in the UK, our team of experts are always focused on the best new products, so we are delighted to partner with Barnes & Noble on the launch of NOOK," said Andy Hannan, Argos Trading Director. "From October, our customers will be able to buy NOOK online and in-store and we are sure it will be one of the must-have gadgets this Christmas." The announcement also marks partnerships between major bookselling retailers in the United States and the United Kingdom. Blackwell's – the leading UK retailer of academic, professional and specialist books – will carry NOOK digital products across an estate which serves 55 universities and major high streets nationwide. "Blackwell's is delighted to announce our partnership with Barnes & Noble to bring NOOK to the UK," said David Prescott, Managing Director of Blackwell's Bookshops and Online. "It was critically important to us that we found a device partner who understood the specific needs of our customer groups. Barnes & Noble's bookselling expertise, academic heritage and market leading NOOK reading devices made them the outstanding choice for Blackwell's customers." Foyles will bring NOOK to its six award-winning, internationally renowned London and Bristol bookshops and its online shop, allowing customers to explore, discover and purchase highly acclaimed NOOK products and content. "Barnes & Noble's NOOK was born in and developed by a bookshop, so it is the ideal digital reading device to be sold by one," said Sam Husain, CEO of Foyles Bookshops. "Foyles is always looking for new ways to recommend books to our customers and with NOOK, our booksellers now have superb hardware at hand to do so. NOOK is a market leader in eBook technology we are delighted to now be able to offer to our customers." Today's announcement reinforces Barnes & Noble's commitment to offer the best choice in reading and tablet products for UK customers, expanding the expected number of UK retail outlets to nearly 800, in addition to various leading online retail platforms offering NOOK products and the company's soon to launch online storefront, www.nook.co.uk. Barnes & Noble is a leader in creating innovative products that provide the best digital reading and entertainment experience for millions of customers today. The award-winning NOOK Simple Touch – the easiest-to-use Reader with the world's best, most paper-like reading screen – and NOOK Simple Touch with GlowLight, which adds an evenly distributed and adjustable light that's perfect for reading in the dark, are expected to be available through leading UK retailers starting this autumn.